Understanding narcissism and how it affects family dynamics. Counsellor Lorna Slade has extensive experience in working with adult children of narcissist parents. We asked her to explain what impact narcissism has for these children and also what a parent can do if they suspect their child is showing signs of narcissism. ‘I was a good girl but I used to lie awake at night listening to her running me down to my father, who said nothing. I concluded that I wasn’t safe and might one day be homeless.’ Not a sign of a happy child – now a client of mine – but certainly a sign of how the child of a narcissist’s mind works. In the media any egotist holding a selfie stick is labelled a ‘narcissist’. There is also a focus on grandiose narcissists with overtly entitled, manipulative and competitive behaviours – in short, larger than life characters who would be easy to identify. The truth is much more insidious in its mundanity: narcissists come in many types and one of the most damaging is the covert narcissist as parent, because their behaviours are often unseen. We all have a degree of narcissism but at the top of the spectrum is Narcissistic Personality Disorder (NPD), part of the DSM-V’s Cluster B group and characterised by total self-focus, manipulativeness and a significant deficit in empathy. The higher up we go, the more problems are encountered. I specialise in working with adult children of narcissists and am constantly amazed at how similar their stories are. Most have coverts as parents, who exhibit the classic traits but in a subtler way. They gaslight – distort or deny events or conversations, they triangulate – set up a ‘golden child’/‘scapegoat child’ dynamic; they have an enabler – experienced as the narcissist’s partner who is seemingly more empathic but essentially loyal only to the narcissist. 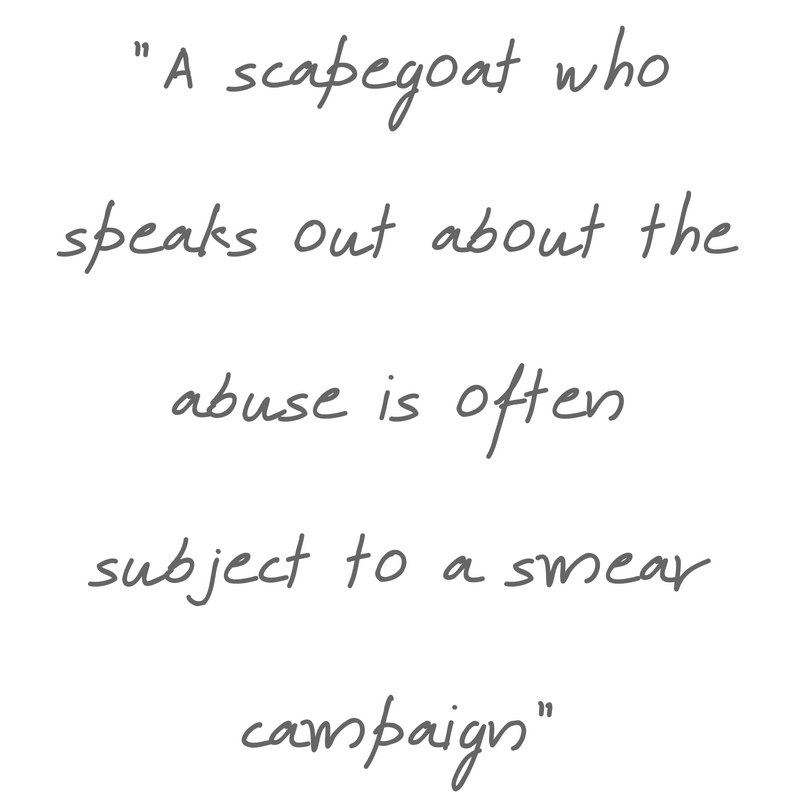 A scapegoat who speaks out about the abuse is often subject to a smear campaign among family and friends. They can be portrayed as unethical, immoral or mentally ill.
Often the scapegoat’s perceptive and feisty nature results in narcissistic rage – with fragile self-esteem and highly sensitive to perceived insults, narcissists can react with anger out of proportion to the situation. In coverts especially, this can lead to long-term plots for ‘revenge’ – often played out in inheritance issues. And finally, hoovering – one of the most stressful aspects of going ‘no’ or ‘low contact’ with a narcissist. Their abandonment schema, lack of boundaries and thirst for ‘supply’ (attention) means they will smear the scapegoat and refuse to respect requests for an end to the relationship. I am also constantly saddened at the brutality of client stories and the emotional and psychological harm this disorder wreaks. Some have been hospitalised with the hurt and shock of a parent’s words and actions, others are almost hermit-like, held prisoner by their core beliefs and punished by a relentlessly critical inner voice. The healing journey takes courage and I find myself deeply respectful of those who are prepared to take that road. Pushing past the thorny bushes of guilt and self-doubt, they are willing to truly grieve the losses they incurred, to overcome their inner critic, to take note of and assert their own emotional and physical needs and to address ‘fleas’ caught from the narcissist. Most profoundly they learn to parent their inner child and develop self-love and self-compassion. Then they recognise their own power. There is no general agreement on how narcissism originates – it’s believed to be a mix of biological, genetic, social and psychological factors. The jury is also out on whether it’s exacerbated by parents who shame and blame the child, or who overindulge it and fail to instil boundaries. Doctors are reluctant to diagnose NPD before the age of 18, but it is the most inheritable of all personality disorders (Livesley et al) and since a narcissistic parent would be unlikely to think they are doing anything wrong the picture is complex. Keep healthy lines of communication open, if not the child will divide and conquer (triangulate). Teach empathy. If the child doesn’t seem to get it, ask them to think deeply about how someone they favour or admire would feel in the same situation. Show them you value character traits like honesty and kindness. Set firm boundaries: name bad behaviours and what you will and won’t accept and hold them to account when you see through manipulative, self-serving and blaming behaviours. Build healthy self-esteem, but show the child they have no more right to special treatment than anyone else. Always reward behaviour, never words. To get more support and to find a counsellor near you, use our advanced search tool.